You are at:Home»Prenosimo iz medija»Luka Mišetić: What Are Croats in Bosnia and Herzegovina Complaining About Now? Luka Mišetić: What Are Croats in Bosnia and Herzegovina Complaining About Now? “Why should I be a minority in your country when you can be a minority in mine?” This one sentence uttered by the son of former Macedonian president Kiro Gligorov famously captured one of the root causes of the wars in former Yugoslavia in the 1990s. No nation wished to remain an ethnic minority in the republic of the other. In Bosnia and Herzegovina (“BiH”), the Dayton Agreement brought a fragile peace by addressing this fundamental conundrum. Dayton established a structure that would ensure equal power sharing among BiH’s three nations (Serbs, Croats and Bosniaks). It defined each of the three nations as a “constituent nation,” as opposed to an ethnic majority or minority, thus ensuring that no group need fear “becoming a minority in the country of the other,” to paraphrase Gligorov the younger. However, the recent election of Željko Komšićas the Croat representative in the BiH Presidency, by ethnic Bosniaks crossing over into the election for Croat representative, has once again triggered political crisis. The majority Bosniak population has elected the so-called Croat member of the BiH Presidency, thus effectively reducing Croats to an ethnic minority and stripping them of their constitutional status as a “constituent nation” of BiH. In the old Yugoslav system, the difference between a “constituent nation” and an ethnic minority was significant: “constituent nation” status guaranteed each nation a right to self-determination through the guaranteed distribution of offices and decision-making rights, thus distinguishing a “constituent nation” from an ethnic minority that could be outvoted by the majority. By effectively stripping the Croats of their status as a constituent nation and reducing them to an ethnic minority whose leaders are being elected by the ethnic majority, the unraveling of the foundational principles of the delicate power-sharing balance achieved at Dayton is now well underway. Particularly troubling is that this recent set of events is the result of failures to honor rulings of the BiH courts. The Constitutional Court of BiH has already ruled that Croats are entitled as a constituent nation to elect their own representatives at all levels of government, without interference from Bosniak (or other non-Croat) voters. In the so-called “Ljubić case,” Božo Ljubić, a BiH Croat politician, filed a challenge in 2014 before the Constitutional Court, alleging that the election law discriminates against Croats as a constituent nation because it does not allow Croats to elect their own representatives to the upper house of the legislature of the Federation of BiH. The Court said that the principle of equality of all constituent peoples is the cornerstone and the overarching principle of the Dayton Agreement and BiH’s Constitution as ruled by the court in year 2000 (in case number U-5/98). It further stated that constituent peoples must be able independently and freely to elect their own legitimate political representatives, without interference from other constituent peoples. The Constitutional Court gave the Parliamentary Assembly (PA) of BiH six months to implement the Court’s ruling. During this six-month period, only Croat parties led by the HDZ BiH introduced a proposal into parliamentary procedure that would implement the Court’s decision. Other political parties did not introduce any other proposal, which is not surprising given that the Court’s ruling was a direct result of a Croat complaint and Croat attempts to reach true equality with the two other peoples of BiH. The Croat proposal passed the Constitutional-Legal Committee of the House of Peoples of BiH, which is made up of Bosniak, Croat and Serb members. Bosniak delegates in the House of Peoples invoked the “vital national interest clause” in May of 2017, attempting to veto the legislation. The Croat proposal was therefore brought up before the Constitutional Court in order to determine whether the HDZ BiH proposal violated Bosniak national interests. The Court ruled in case U-3-17 (the so-called “Čolak Case”) on July 6, 2017 that the HDZ BiH proposal did not harm vital Bosniak national interests. The Court ruled that the proposal is constitutional and could be brought up for vote. The proposal then passed the House of Peoples, but was ultimately voted down by the delegates from Bosniak parties in the House of Representatives (lower house) of BiH. Given that the Parliamentary Assembly of BiH failed to implement the ruling within the given legal period of six months, the Constitutional Court on July 6, 2017 annulled the unconstitutional provisions of the electoral law, leaving the Federation of BiH and the national level of BiH without a legal basis to fill upper houses of their parliaments. This legal vacuum exists to this day. Elections were nevertheless held a few weeks ago, despite the fact that no electoral law exists which would allow for the formation of the House of Peoples in the Federation and at the national level. For reasons that I will explain in a subsequent blog post, this situation has created a constitutional crisis in BiH, and calls into question the legitimacy of the elections, including the election of Željko Komšić. The election of Željko Komšić violates the Constitution of BiH because he was not elected by the Croat constituent nation he is supposed to represent, which is a foundational principle of the BiH Constitution as per the Constitutional Court of BiH. Who is responsible for this situation, which puts BiH in an unprecedented constitutional crisis? This brings me to an article by Jasmin Mujanović, titled “Croatian Ruling Party’s Dangerous Meddling in Bosnia,” and published on Balkan Insight on October 24, 2018. Mr. Mujanović makes a series of false or unsubstantiated claims in an effort to deflect blame from Bosniak elites for the current situation, and onto the HDZ BiH, the leading Croat party in BiH. A closer analysis of Mujanović’s claims shows that his analysis has no foundation and does not withstand scrutiny. Mr. Mujanović first makes sensationalist claims that the ruling party in the Republic of Croatia, the HDZ, coordinated with Russian intelligence operatives to engage in systematic absentee voter fraud in BiH. These allegations are based on three articles written by Bosniak journalist Avdo Avdić that were published on Avdić’s internet portal. In these articles, Avdić alleges a link between HDZ in Croatia (a NATO member) and Russian intelligence operatives. However, Mr. Avdić attributes these claims to the “reports of foreign secret services,” but does not disclose the identity of any such “foreign secret service,” his source for the assertion, or any other evidence that would tend to support the claim. Because these claims are unsubstantiated, Mr. Mujanović’s reference to them –without disclosing to the reader that there is no known evidence to support the claim – is surprising. Moreover, the substance of the allegation –absentee voter fraud – is demonstrably false. The HDZ’s candidate for the Presidency, Dragan Čović, received only 11.486 absentee ballots. Given that the 2013 census records more than 200,000 Croats as having left BiH because of the war, 11,486 absentee ballots indicates a low absentee turnout of Croats outside of BiH in general elections. For the record, there were 48,276 absentee ballots for the Presidency election in total. Mr. Mujanović’s claims of voter fraud and stolen elections do not withstand the most basic scrutiny. Mr. Mujanović’s claims that “representatives of Croatia’s assorted liberal and social democratic parties have widely welcomed Komšić’s victory” are also patently false. The entire Croatian political spectrum, from left to right, has objected to the election of Željko Komšić as the Croat Member of the Presidency. The leader of the opposition Centre-right party “Most” (Bridge), Božo Petrov, was even more vocal than HDZ representatives, calling for Komšić to be declared persona non grata in Croatia. Most importantly, the leaders of the biggest left-wing party in Croatia, the Social Democratic Party (“SDP”), have also objected to Komšić’s election. The SDP’s leader, Davor Bernardić, has stated that the Constitution in BiH should be changed in order to find a solution to the “Komšić issue.” Another member of SDP’s presidency, Ivo Jelušić, has stated that because Bosniaks (and not Croats) elected Komšić, he cannot represent Croats and his election is bad for BiH. His party colleague and member of the European Parliament, Tonino Picula, stated that Komšić’s election is a manifestation of the will of those who want a unitary BiH, which runs contrary to the values promoted by the European Parliament in its resolutions calling for the respect of federal principles in BiH and the equality of the three constituent peoples. Vesna Pusić, a member of the minor Civic Liberal Alliance party, did say that Komšić was elected according to the same rules that Čović was elected last time, and therefore he should be accepted. Nevertheless, this does not constitute a celebration or welcoming of his victory. No MP in the Croatian Parliament celebrated Komšić’s victory, contrary to Mr. Mujanović’s claims. Mr. Mujanović next falsely claims that Livno and Ljubuški (predominantly Croat towns) are ethnically homogenous, while Tuzla and Sarajevo (predominantly Bosniak cities) are multiethnic. He uses this claim to support his thesis that BiH Croat leaders want to prevent Croats from “multiethnic” cities from voting, while allowing only Croats from ethnically homogenous areas to vote for Croat leadership posts. In Livno, which Mr. Mujanović calls an “ethnically homogenous town,” Croats make up only 62% of the population, almost 20% less than the 81% of Bosniaks in “multiethnic” Sarajevo and 15% less than the 76% of Bosniaks in “multiethnic” Tuzla. What criteria is Mr. Mujanović applying in order to justify his labeling of Livno and Ljubuški as “ethnically homogenous,” while Sarajevo and Tuzla are “multiethnic?” It is clear that Sarajevo and Tuzla were once multiethnic, but they are not multiethnic any longer. Mostar, while multiethnic in aggregate, is also a divided city with a clear majority of one group in each half of the city. The city is far from a multiethnic paragon. Just as importantly, contrary to Mr. Mujanović’s claims, Croat representatives have never claimed that the Croat member of the Presidency should be elected exclusively by voters from Livno and Ljubuški, or other Croat-majority areas. Instead, they consistently stated that the Croat member of the Presidency should be elected by Croats residing throughout the Federation, without interference from Bosniak voters. Mr. Mujanović next alleges that “this gerrymandering is meant to institutionalize an electoral monopoly for the HDZ’s nationalist-conservative, western Herzegovinian electorate and disenfranchise more progressive and moderate Croats from Bosnia proper.” This claim has no basis in fact and is simply not correct. First , Dragan Čović, the HDZ candidate, won a majority of votes in virtually every single municipality in which Croats make up more than 45% of the population, receiving more than 80% of votes in many of these municipalities. 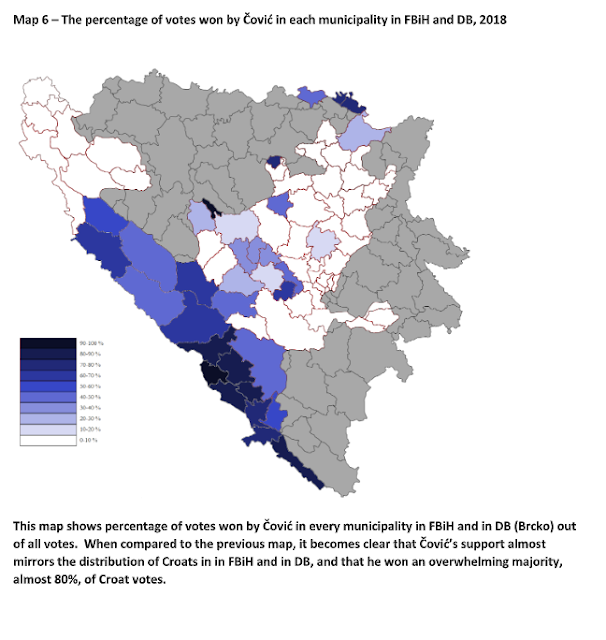 Out of all Croats living in the Federation of BiH, around 80% of Croats live in municipalities in which Čović won the most votes. 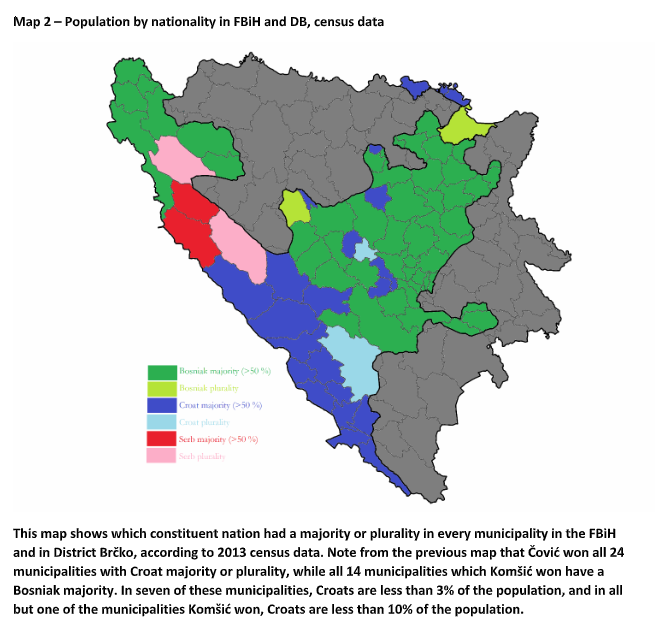 This includes all 12 municipalities in Bosnia with Croat majority or near majority, as well as 10 municipalities in Western Herzegovina and 4 municipalities in Northern Herzegovina and Završje regions adjacent to Western Herzegovina. Of his overall vote total, only 67,443 of Čović’s votes came from ten Western Herzegovina municipalities. In total, Čović won 82,658 votes in the three cantons which make up the wider Herzegovina region. In the seven cantons which make up the Bosnia region, plus the Brčko District, Čović won 58,693 votes. In other words, Čović won roughly 48% of his vote in Western Herzegovina and 52% outside of it (i.e., the areas of Bosnia plus municipalities that are adjacent to Western Herzegovina). When we add other Herzegovinian municipalities that are adjacent to Western Herzegovina , the ratio between all of Herzegovina and all of Bosnia region is roughly 58:42. For comparison, in the Federation of BiH and District Brčko, roughly 54% of Croats live in the greater Herzegovina region (including Northern Herzegovina and Završje), and 46% in the Bosnia region. 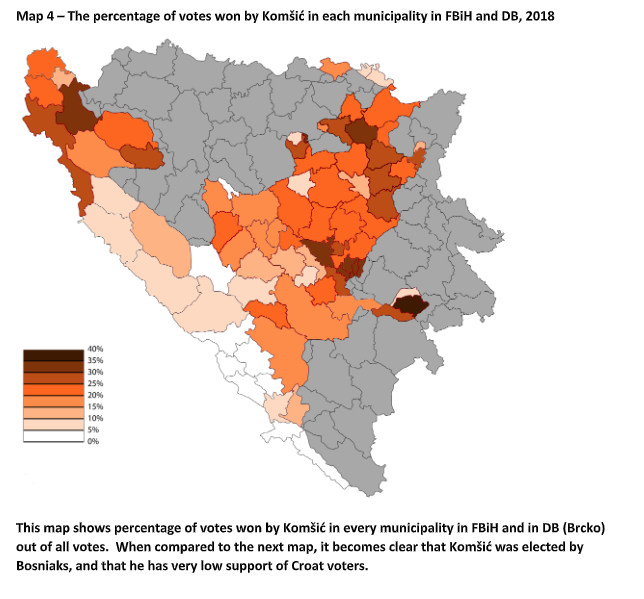 Contrary to Mr. Mujanović’s assertions, the analysis of voting patterns demonstrates that Čović on average received almost exactly the same level of support in both Western Herzegovina and Bosnia. On what basis can Mujanović claim that Herzegovinian Croats are more “nationalistic” than their “progressive” fellow Croats in Bosnia proper, if Čović’s votes in these two regions almost mirror the ratio between the numbers of Croats present in these two regions? The dominance of the HDZ among Croats in Bosnia proper becomes even clearer when one looks at the preferences of Croat voters for political parties. In Mujanović’s so-called “hardline nationalist” Western Herzegovina, HDZ and its coalition won 67% of all votes given to Croat parties in the Western Herzegovina Cantonal assembly, meaning that the ratio of votes between HDZ and other Croat parties was 67:33. In Canton 10 (Livno), which is adjacent to Western Herzegovina, this ratio was 44:56, meaning that other Croat parties all together won more votes than the HDZ coalition. In Herzegovina-Neretva Canton, this ratio was 78:22. 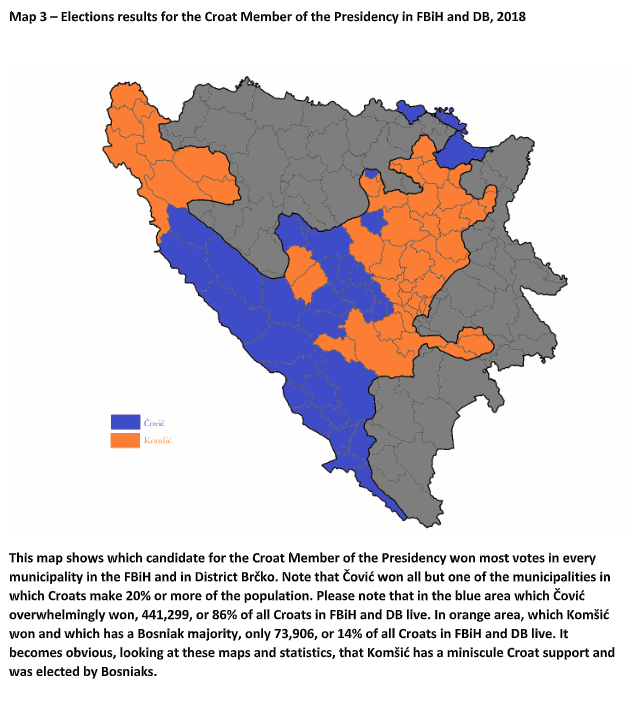 In Mujanović’s “progressive and moderate” Bosnia, Čović and HDZ enjoyed the same or even greater support among Croats than they did in Western Herzegovina. In Central Bosnia, for example, Croats voted for HDZ by a ratio of 87:13. In Posavina Canton, the ratio between HDZ votes and other Croat parties was 72:28. In Zenica-Doboj, this ratio was 91:9. 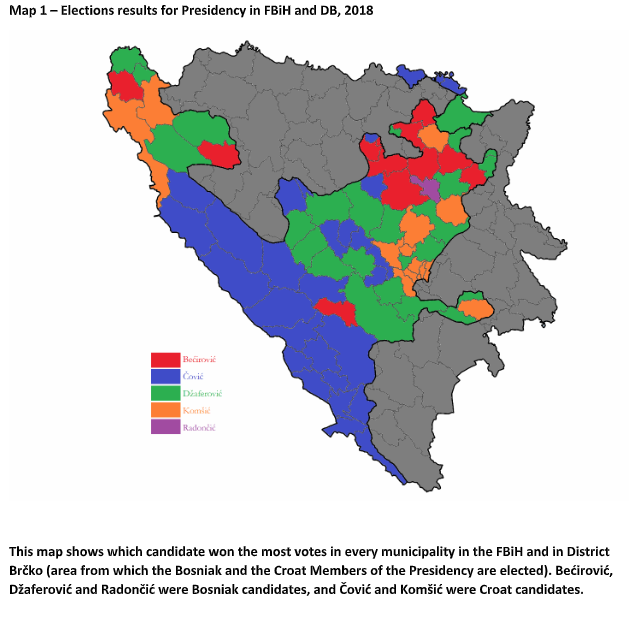 Even when we add some 16,000 Croat voters in Bosnia that could theoretically (but not likely) have voted for multiethnic political parties, the HDZ still won support of at least 70% of Croats in this region. In comparison, HDZ won support of 69% of Croats in Herzegovina. In total, HDZ received 68,027 votes in Herzegovina and 58, 246 votes in Bosnia. The ratio, 54:46, mirrors the ratio of the Croat population in these two regions. All told, HDZ did, on average, about the same in Bosnia as it did in Herzegovina. Mr. Mujanović next claims, “Both the Bosnian and Croatian HDZ argue, however, that it is not enough for the Croat member of the presidency to simply identify as a Croat, as Željko Komšić does. Instead, the Croat member should be elected exclusively by the segment of Bosnia’s Croat community residing in majority Croat areas.” This too is false, and Mr. Mujanović offers no citation to any HDZ claim to this effect. Because the Croat Member of the Presidency represents not only citizens of the Federation, but also Croats as a constituent people, it is clear that he has to have their support in order to be their legitimate political representatives. The same is valid for representatives to the House of Peoples of the Federation, the House of Peoples of BiH and the Council of Peoples of Republika Srpska. These three bodies are intended for exclusive representation of Constituent Peoples (and Others, at the entity levels), while the Presidency is intended for both general citizens representation and the representation of Constituent Peoples. 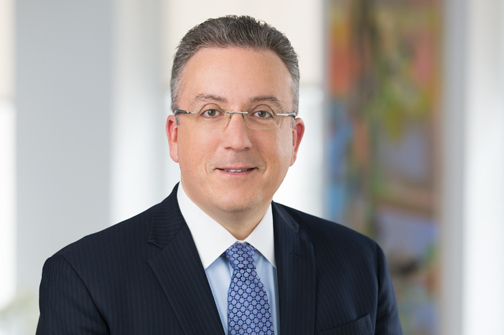 The Court was also specific in its ruling that it is unconstitutional for members of one constituent people to elect representatives of other constituent people. This goes against the overarching Dayton principles of equality of the three constituent peoples. The principles of power-sharing, parity, and equality, no matter how imperfectly implemented in their current state in BiH, are part of European legal practice and part of other complex and multi-ethnic federalist states in Europe, such as Belgium, Switzerland and the UK. They are not akin to the horrible practices of Bantustan, as implied by Mujanović. Finally, Mujanović claims that “reactionary politics” of HDZ are opposed by “virtually the entire Bosnian political establishment.” This too is not true. The vast majority of political parties in BiH recognized the need to reform the electoral law. Virtually all Croat and Serb political parties and some Bosniak parties acknowledge this priority. After all, the “Bosnian (and Herzegovinian) political establishment” includes all parties in Bosnia and Herzegovina, including Croat and Serb parties, and not only the Bosniak (and non-ethnic in name but majority Bosniak) parties preferred by Mr. Mujanović. Moreover, the leaders of the seven largest parties in BiH, including the two largest Bosniak, Croat and Serb parties and multiethnic SDP, agreed on October 1, 2013 in Brussels that “the method of election of the two Presidency Members from the Federation of BiH through constitutional amendments should, in addition to the Strasbourg Court ruling, prevent imposing the outcome of election results on any Constituent Peoples or “Others”.” This means that Bosniaks should not impose upon Croats a “Croat” president (like Komšić) in the tripartite Presidency. Mr. Mujanović cites Serwer in his claim that election law reform ordered by the Constitutional Court “would be equivalent to a contemporary ‘Three-Fifths Compromise’” under the HDZ proposal, and that it would discriminate against “more progressive” Croats in Bosnia. If one wishes to maintain national parity (as insisted by Serbs and Croats) but objects to representation and voting along ethnic lines, then a model based on Swiss cantons or the Belgian model or US states would combine both objectives. A third, majority Croat entity should be created to protect Croat rights as a “constituent nation,” which would result in the removal of ethnic quotas and allow all people in each entity to run for office and vote for their candidate of preference, regardless of ethnicity. For Bosniak parties, this is a non-starter due to the ever-present fear that a third, Croat entity will lead to the inevitable partition of BiH. But objections to collective rights of ethnic groups ultimately leads to only two options: (1) the creation of a third, Croat entity followed by removal of an ethnic model for offices and voters, or (2) the removal of all entities and imposition of the “1 person, 1 vote” model across all of BiH as one electoral unit. The second option is a non-starter for Croats and Serbs because it threatens to convert them to national minorities. When one carefully analyzes the options, the current Dayton model (as interpreted in the Ljubić decision) remains the most viable option. The HDZ proposal, although less than perfect, passed the Constitutional-Legal Committee of the House of Peoples of BiH. The Constitutional Court deemed it constitutional. While the vote value of a Croat voter for the House of Peoples was slightly different, that ratio was much closer to equal than the previous system which vastly overrepresented Croats in some regions (especially in Bosnia), and underrepresented them in others, including West Herzegovina. Mr. Mujanović claims that “when a coalition of Bosniak and multiethnic parties proposed a solution to the Ljubić case, one which was broadly supported by the international community, it was the HDZ that sank the deal.” This is simply false. The Bosniak proposal included literally the same provisions that the Constitutional Court of BiH found to be unconstitutional and annulled earlier. The Bosniak parties also introduced their bill in the wrong chamber of government in BiH, a chamber of government that had no legal authority to implement the Constitutional Court’s ruling. The Constitutional Court ordered the Parliamentary Assembly of BiH to implement the decision and reform the Election Law of BiH, which is a state-level law (i.e., a law that applies across all of BiH, as opposed to a law at the entity level, or Federation of BiH level). The Bosniak and multiethnic parties introduced their proposal in the Parliament of the Federation of BiH, at the entity level. Obviously, the Parliament of one entity (the Federation) does not have the authority to amend the state-level Election Law across all of BiH. The Constitutional Court of BiH was clear that only the Parliamentary Assembly of BiH has both the authority and the obligation to implement the ruling. The move by the Bosniak and multiethnic parties to amend the law at the entity level was unconstitutional. Furthermore, the Bosniak proposal did not have the support of the international community. On the contrary, US Ambassador Cormack and EU Special Representative Wigemark, in a joint statement on March 29, 2018, said that political leaders must resolve the election law reform “taking into account the decision of the BiH Constitutional Court in the Ljubić case and the existing legal framework.” Concerning the Presidency, they stated, “Parties must focus first on urgent priorities, including the Federation House of Peoples and Mostar, and wait until after the election to address other questions, including the Presidency, in line with relevant ECtHR and Constitutional Court rulings.” They refused to impose a solution and clearly stated that the solution for reform must come from local actors. They also refused to endorse any proposal but chose simply to facilitate dialogue. As these two representatives of the international community stated, the implementation of the Ljubić decision for the Presidency should also include relevant ECHR rulings. However, HDZ is not obstructing these changes, contrary to Mr. Mujanović’s claim. The members of the international community themselves have stated that the Federation House of Peoples should be a priority, and after the election law is reformed and the government is formed, ECHR rulings should also be implemented. Finally, no one doubts that ECHR rulings must be implemented, but ECHR rulings should not be manipulated by those that wish to deny the equality of the constituent peoples guaranteed in the Constitution, with the ultimate objective of reducing Croats to an ethnic minority. As noted above, the Constitutional Court of BiH ruled in 2000 that the mutual equality of constituent peoples is “the overarching principle” of the whole Constitution to which all other principles, laws, and legal acts, including entity constitutions, must adhere. This mutual equality of constituent peoples is both the overarching principle of the BiH’s Constitution, as well as the “spirit of Dayton,” i.e., the guiding principle of the Dayton Agreement. Concerning Komšić, the framers of Dayton never imagined that one constituent people would elect representatives of other constituent peoples. Such practice is outside of the scope of good political behavior in a complex state. It is hard to imagine one of the three Communities in Belgium electing representatives of the other Community. This is because, through several cycles of federalization, checks and balances were put in place to prevent this and ensure legitimate representation. Second, there is no doubt that the European Union is a guarantor of Dayton, inter alia through the EU’s role on the Steering Board of the PIC (where both the European Commission and the Presidency of the European Union are members). As a member state of the EU, Croatia is entirely within its rights to express its views to the internal institutions of the EU, including the Presidency, the Commission, and the European Parliament. Third, Article 10 of the Constitution of Croatia obligates the Croatian state (including its Government) to “guarantee particular care and protection to those portions of the Croatian nation in other countries.” Accordingly, the Croatian government has a constitutional obligation to protect the rights of Croats in BiH. Croatian Prime Minister Andrej Plenković was absolutely correct when he noted that Komšić’s election violates the “spirit of Dayton.” The “spirit of Dayton” is based on the principle that all three nations are guaranteed both equal collective and individual rights. No group need fear that it will become “a minority in your state when you could have been a minority in ours.” The election of Komšić amounts to a repudiation of the promises of Dayton and invites a return to an atmosphere of collective fear that led to tragic consequences in the 1990s.